Thanksgiving is just around the corner. And once again Westwood Cardinals Football will help make the annu al Helping Hand Food Pantry Turkey Drive a great success. For the 5th straight year, the players will give back to a community that shows them great support all season long with a wonderful Cardinals Care program. (PARENTS - contact Suzanne Hopkins if you can volunteer to drive) - 4:30 pm arrival at King's in Hillsdale (meet behind the store by the loading dock) to load donated turkeys into cars and transport to Food Pantry (349 Hillsdale Ave, Hillsdale,). Freshmen should remain until upper classmen arrive. SOPHS/JRS/SRS - 5:30 pm arrival at Food Pantry ( 349 Hillsdale Ave, Hillsdale) to begin sorting through donations and help carry packages up stairs and outside along with clean up as the evening concludes at approximately 7:30 pm. 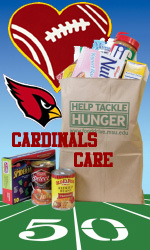 Bring a non perishable food item to our next Cardinals Football home game on October 21st! All donations collected on this Friday night will be distributed to our local food banks. Please Click here for a list of most needed items for donation. ESPN's The Man in the Red Bandanna tells the story of Boston College alumni, Welles Crowther, who tragically lost his life while making heroic efforts during the 9/11 terror attacks on the World Trade Center. Westwood football will honor his legacy and all those who lost their lives that day by supportingt the Welles Crowther Charitable Trust this fall at our 9/15 home game vs. Pascack Hills with the sale of red bandanas. Hills will join us with the sale of orange bandandas at their school as well. All proceeds will be donated to the Welles Crowther Charitable Trust which recognizes and awards academic and athletic excellence in young men and women who serve their communities through education, health, recreation and character development. The Trust supports other not-for-profit organizations that benefit young people through annual gifts and special awards. * For more information and /or to request player and coach assistance for a worthy community cause, please contact Suzanne Hopkins or Heather Henry.